Jane and I were pleased to turn over our year of glory as last year's BuilConn “Buildy Visionaries” to this year's winner Jack McGowan. Our prolific contributing editor's vision has transformed him into Mr Gridwise. In addition to winning this award Jack also won the best keynote speaker with only 5 minutes preparation when a GridWise keynote was unable to attend at the last moment. We provided a short overview of our year of glory as last year's visionaries and thanked those that had bestrode on us this honour. We were quick to point out that AutomatedBuildings.com is a conduit for the industries visions and the fact that much of the industry speaks through our online web site provided us a inside track to repeat their collective visions. I was also quick to point our several significant industry events that were not in our vision at the time of last year's award have now occurred; the entry of Cisco into our industry and the ratification of the GridWise constitution. I used these two major points to demonstrate how quickly our industry is changing for even those tagged as visionaries. The nominees for this year's Buildy Visionary award are all industry icons and we had difficulty voting as all of them have been activity involved in our web site. 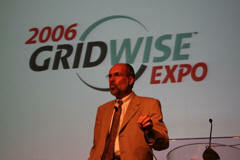 We were pleased that Jack McGowan, our contributing editor won for his visionary work with Gridwise. The Gridwise events, sessions, and demonstrations were very well attended at this year's GridWise Expo co-located with BuilConn. 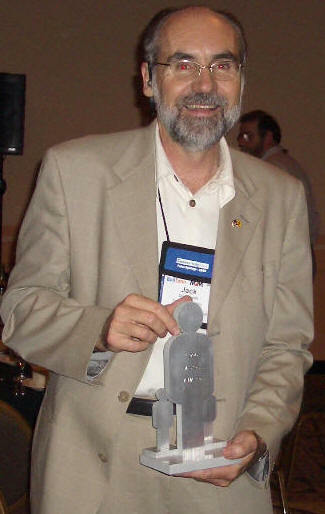 We are honoured to also have BuilConn’s first visionary award winner Paul Ehrich as one of our contributing editors. This coupled with Anto’s Newsmaker and Shaker of the year award help us insure that we the staff of AutomatedBuildings.com are providing insight into the future of the building automation industry.